I just came back from Washington, DC, where I attended an AAAS meeting on Climate Change Resilience and Governance, which included speakers from local governments and federal government agencies, nongovernmental organizations (NGOs), industry, and academic researchers. The meeting’s program is here. I’ll summarize the presentations and debates that I found interesting, but if there are others you’d like to hear more about, let me know. By the way, I should do this more often when I write about conferences, but the hashtag participants used is #RGR14. First I’ll tell you what we mean by resilience and governance, then I’ll mention a couple important new developments that people talked about throughout the conference, and then I’ll tell you about some of the major issues and themes we discussed. If you don’t want to read all the details below, the major issues included these: the framing of climate change with different people; water issues, including droughts and floods; responding and recovering from disasters; and economic issues. If you’re interested in my previous posts about climate change issues, including an introduction to the concept and implications of climate change, look here. I and others usually focus on climate change mitigation, since we’re working to avoid the worst of climate change and reduce its many potentially harmful effects. Nonetheless, we know that the climate is changing and our planet is warming. Even with radical and politically unlikely changes to our fossil fuel-based economic system, we still have to contend with the greenhouse gases we’ve already emitted, which will warm the planet by an average of at least 1.5 or 2 C this century, according to the recent report by the Intergovernmental Panel on Climate Change (IPCC). Therefore, we need to adapt to the expected consequences. Let’s be clear though: we need to work on both mitigation and adaptation simultaneously (a point explicitly made by Susan Ruffo, of the White House’s Council on Environmental Quality). “Resilience” is similar to “adaptation,” though it sometimes refers to efforts to restore things back to normal after a weather-event or climate-related disaster, but as some speakers pointed out, in the future we may be adapting to a new normal. “Governance” refers to actions being taken by local, national, and international governments, and it’s of course related to politics and policy. At the meeting last week, it was Laura Petes (an advisor at OSTP) who defined these terms (and see this executive order for official government definitions). 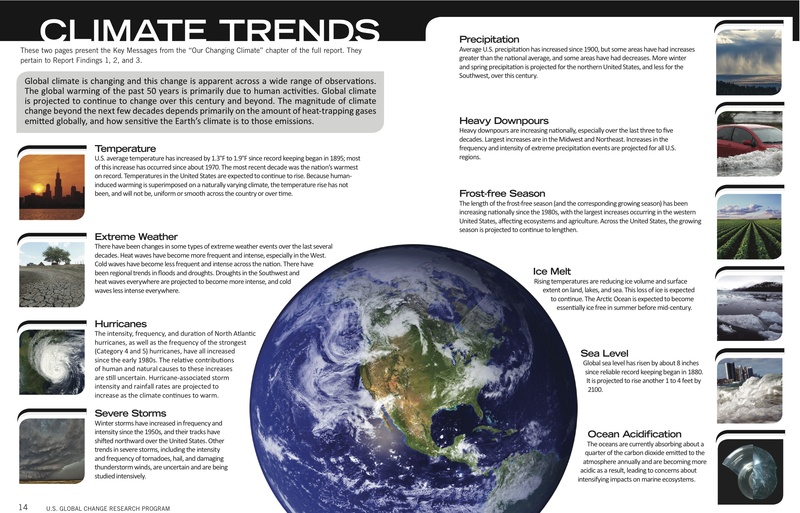 The report includes an entire chapter dedicated to adaptation, which describes examples of actions being taken by federal agencies, states, cities, NGOs, and the private sector, and outlines the next steps, including the identification of critical adaption threshold or “breakpoints” beyond which social or ecological systems are unable to adapt to climate change. 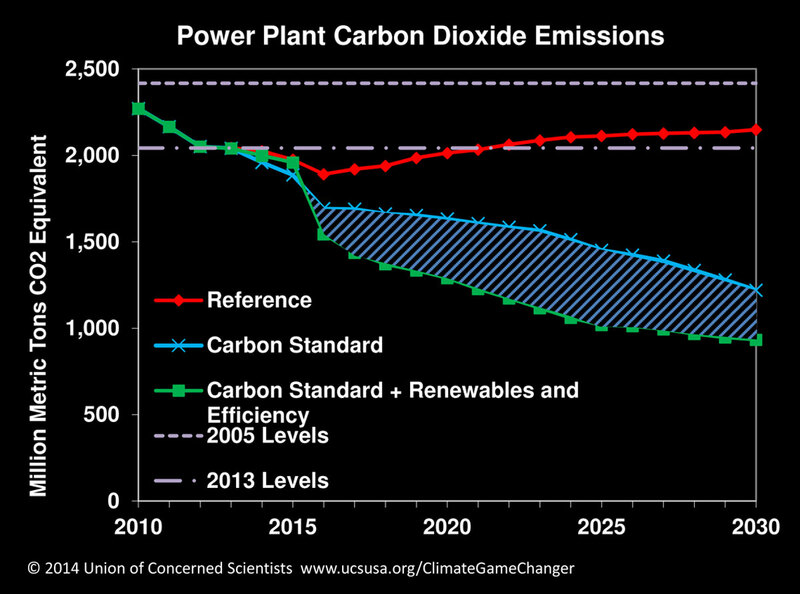 In addition, a week ago the Environmental Protection Agenca (EPA) announced new power plant carbon standards. According to Ken Kimmell of the Union of Concerned Scientists (UCS), this is a potential game changer. 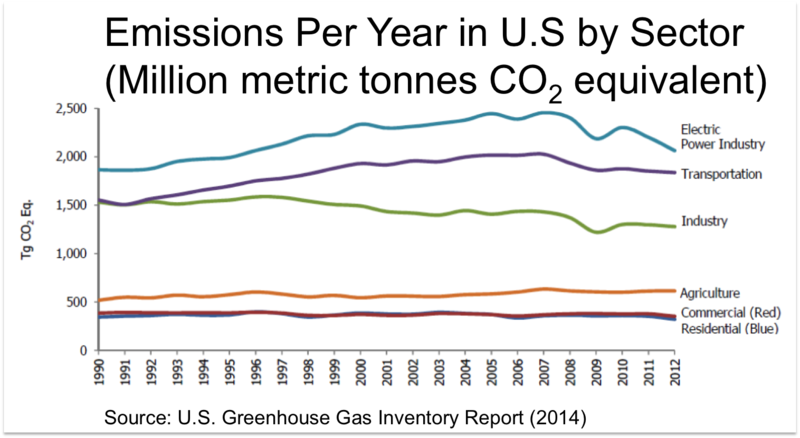 As you can see in the following graph, power plants, especially coal-fired ones, dominate our carbon emissions, and these standards could reduce those emissions by half by 2030 (to less than a million metric tons of CO2). The EPA and its administrator, Gina McCarthy, should be applauded for taking this important first step. The new standards must be combined with major efforts to ramp up renewable energy technologies and improved energy efficiency, and they will require strong leadership from the states. As argued by Vivian Thomson (professor at U. of Virginia) at the meeting, California, New York, and Washington are among the “active states” on climate change, and most of the rest of the country can do much much more. A number of speakers argued that we should be careful about how we frame these issues when interacting with different communities and different sectors of the public. For example, some people react different when they hear “global warming” versus “climate change.” Some people can be turned off by hearing either of these, but they will be receptive when they hear about energy efficiency and ways to reduce their family’s gas and electricity bills. In addition, terms like “sustainability,” “smart growth,” and “resilience” may be too vague, but “risk reduction” in a specific context can be clearer, for example. I’ve written before on water policy issues in the southwest , where we’re always talking about drought, but in the east, people are worried about floods and stormwater. Water issues are perhaps the most important of those facing us, and it’s no surprise that the NCA devoted two chapters to water resources and interactions between water, energy, and land use. I should note that climate change affects the food supply as well, through agriculture, fish catch, rising food prices, and so forth. Many speakers spoke about water issues. Susan Leal (who co-authored a book, Running Out of Water) pointed out that most people take water and wastewater for granted, but maybe the shouldn’t. We should expect water rate payments to increase in the future. Pilar Thomas, who works with the Department of Energy, spoke about the water-energy nexus and the vulnerability of energy systems. She also spoke about water law and water rights, since disputes between states, tribal communities, and the private sector about water will surely increase in the future. I asked a question about preparing for future droughts, and these speakers argued that we can gain much from reduced water usage in agriculture and the food industry; water recycling in urban areas; and maybe we should try again to have “Meatless Mondays,” since producing a pound of animal protein requires, on average, about 100 times more water than producing a pound of vegetable protein (and beef is the worst). I was happy and impressed that many speakers, especially Jalonne White-Newsome (WE ACT for Environmental Justice), Michael Dorsey (member of EPA’s National Advisory Committee), and Barbara Allen (professor at Virginia Tech) discussed important issues of environmental justice, injustice, and inequality. In my opinion, we don’t talk about these issues enough, and we certainly aren’t adequately addressing them. If you’re interested in learning more about environmental justice (EJ), see my recent post about the issues involved. Currently EJ communities are not engaged in the process, argues Dr. White-Newsome, and the failure to mobilize the majority of Americans to want action on climate change is partly due to the fact that not everyone is part of the conversation. Many black, Latino, and Native American communities, as well as working class white communities, live closer to power plants, land fills, oil drilling platforms, polluting industries, etc., and are in more vulnerable areas, such as those that will be affected by rising sea levels, droughts, fires, hurricanes, and so on. Dr. Dorsey talked about the injustice of extreme weather events, such as Hurricanes Katrina and Sandy, which should not be seen as “acts of God.” (He also had a way with words; at one point he referred to “persistent corporate sociopathy.”) Dr. Allen argued that we need endogenous ideas for transforming a community, such as when a community is rebuilding following a weather event, but if green technologies and buildings seem like too external to people, then they won’t “take” and will be less popular and successful. A couple speakers, such as Sabrina McCormick (professor at George Washington U.) and Dr. Allen, talked about the benefits and perils of “disaster thinking.” It can be dangerous to think of climate change as a series of disasters; we might benefit from seeing the opportunities for improvement, such as by appealing to people’s self-interest. (For example, because of successful incentives, Germans now associate climate change and renewable energy with ways to make money.) Nonetheless, we can expect more weather events, flooding, and temperature extremes in the future. In fact, and this was new to me, heatwaves kill more people than all other weather events combined! Young children and people over 65, especially those on the top floors of poorly cooled buildings in dense urban areas, are among the most vulnerable. Simple solutions like white-painted roofs can save many lives. Finally, a few people, especially David Orr (author of seven books and professor at Oberlin), Kate Sheppard (reporter at Huffington Post), and Gar Alperovitz (writer and professor at U. of Maryland), talked about economic issues and policies. Dr. Orr discussed the relation between carbon emissions, climate change adaptation, and economic systems and unequal wealth distributions. He warned that, if the current political culture doesn’t change, “when times get rough, humans get nasty”—fairness goes out the window. Katrina is just an example of what’s to come. What will governments have to do when sea levels rise to get people out of harm’s way? It will help if we begin to think more like a community. We’re all in this together, but as it is now, the 7% richest people are responsible for half of carbon emissions, while the costs of climate change are being outsourced to the third world and future generations. Dr. Orr also asked a couple provocative questions: Is our capitalist system resilient and sustainable? Is democracy sustainable? (He asked this in the context of a point that Exxon-Mobil could legally burn all of their reserve fossil fuels and single handedly take us all past the tipping point.) While specific questions about responding to the next big storm are important, we should also be asking these big questions about systemic challenges, since climate change is likely the biggest crisis of our time.